In this politically polarized country of ours, the use of the term “fake news” is derided by some and cheered by others. 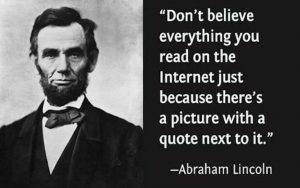 However, what has now been characterized as “fake news” is really nothing new. From time immemorial statements made, events occurring, things seen or observed, have been sensationalized, exaggerated, if not twisted and turned – not to the point of being false, but to give them unwarranted weight, meaning or significance. Why? Some sort of agenda-perhaps. But most likely because making things interesting is what sells. The issue today is the blurring of the lines between something of interest from that which is newsworthy. This is not limited to the political arena, but throughout all aspects of our culture and society. The law is not immune from this phenomenon-family law included. On a regular basis we see or read stories in newspapers, magazines or on the internet of various celebrities or public figures going through the tribulations of separation, divorce or other domestic problems. Some are truly newsworthy, such as allegations of domestic violence or abuse. Some are just are disturbing, such as when children are thrown into the middle of custody disputes made public — the Alec Baldwin taped conversations with his daughter come to mind. However, most often we see banners trumpeting or headlines blaring the outcome of a celebrity’s divorce case-as though it was somehow newsworthy or legally significant-when in most cases it is not. How many times do we see reports of one celebrity parent or the other receiving “joint custody” of their child(ren) in a divorce or split-up? How many times do we see reports of a celebrity being obligated to pay alimony to their spouse? How many times do we see reports of a celebrity being required to pay what is labeled as a generous amount of support for the benefit of their child(ren)? Beyond the fact that celebrity families are involved, these reports suggest that the disposition of these matters was somehow newsworthy, unusual or extraordinary in nature. As practitioners of family law, we know that in most cases they are not. Under the New Jersey’s divorce laws (as is generally true in most states), there is a presumption of parents sharing “joint” (albeit usually legal) custody of their children; dependent spouses are entitled to some level and/or duration of alimony or spousal support commensurate with the marital standard of living, particularly in longer term marriages; and children are entitled to be supported by their parents not only consistent with the marital standard of living but to also share in the “good fortune” of their parents. However, what prompted me to write this blog post was a news report exclaiming that the ex-wife of actor Kelsey Grammer had been awarded one-half of his retirement fund with the headline ” “Camille Grammar Scores a Big Payday From Ex Kelsey Grammar”, and then reporting that she was awarded 50% of the funds in her former husband’s 401K account accumulated from the time of their marriage in 1997 to their separation in 2010. The implication of the headline of this story was that this award was somehow significant and newsworthy. IT IS NOT! Certainly under New Jersey law a contrary result would have been more newsworthy. While under our equitable distribution laws courts are cautioned not to mechanistically divide marital assets equally, absent some truly extraordinary set of circumstances, a retirement fund such as an IRA or 401K accumulated during the course of a long term marriage (such as the Grammers) would be allocated or divided on a 50/50 basis. My issue is not that the content of the story itself is false. My issue was the media’s reporting of this matter as somehow being newsworthy, and in so doing, either intentionally or ignorantly misleading the public over the law or one’s rights in family law matters. A telling example of “fake news” family law style. Don’t be mislead. Let the attorneys at James P. Yudes, P.C navigate you through the reality of family law in New Jersey.